A politically appointed adviser to the Environmental Protection Agency submitted a vocal resignation letter last week praising President Trump and denouncing the political “left.” That put the agency’s press office in an awkward position. The letter, according to news reports and confirmed by EPA to Government Executive, was provided to reporters by the press office. 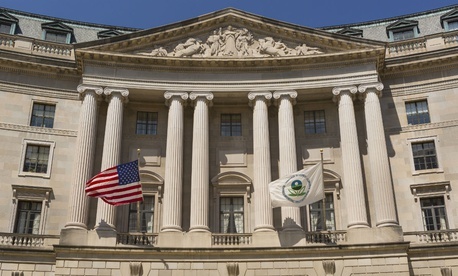 That prompted the nonprofit advocacy group Public Employees for Environmental Responsibility on Monday to file a complaint with the Office of Special Counsel seeking a probe of an alleged Hatch Act violation. PEER asked the OSC, the chief enforcers of the Hatch Act, to “identify which EPA press office staff were involved in circulating or providing her letter and whether these actions were directed by more senior officials. Notably on the day of her resignation, acting Administrator Andrew Wheeler issued a statement commending Ms. Gunasekara's tenure at the agency,” PEER said in a release. "Federal offices should not be converted into Trump campaign centers," PEER Executive Director Jeff Ruch said, noting that Trump became a formally declared candidate for reelection shortly after his inauguration. "We are asking OSC to determine which officials and what official resources were involved in this patently partisan political activity." Gunasekara, according to her LinkedIn profile, just started an organization called the Energy 45 Fund. She previously did stints working for Republicans on the Senate Environment and Public Works Committee and for Rep. Mike Coffman, R-Colo., and held other congressional staff jobs, as well as completing legislative tracking for the National Association of Chemical Distributors. The EPA’s press office under Trump previously drew criticism for being overly aggressive in trying to discredit career staff who resigned in protest of the new policies the agency has taken on under Trump.